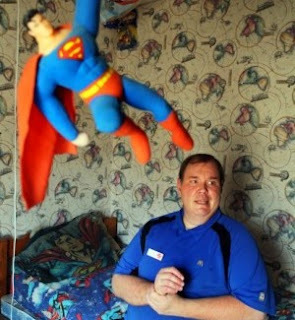 When a former co-worker named “Gary” recently made off with Mike Meyer’s entire Superman collection valued at over $5,000, the restaurant worker who suffers from a mental disability thought the odds of seeing his life’s work again was a miracle only his childhood hero could pull of. Turns out restoring Mike’s faith in the human race isn’t a job for Superman – but a league of them. As this vid illustrates, looking to fill as many of the gaps as possible in Mike’s now absent collection, The Superfriends of Metropolis are using their Superman fan club connections to spearhead the now global aid efforts, coordinated by Keith Howard. No easy feat, when stolen items include almost 100 figurines, an old time radio, a monopoly game, TV set and over 1,800 comic books, some dating back to the 1950’s! Mike has been left with few super-items, luckily his dogs Krypto and Dyno, and a hand-sewn Superman costume hanging on his back door. Original artwork from as far away from Paraguay is on it’s way, celebrities are supplying autographs, and a comic shop owner in the hometown of Superman creators Jerry Siegel and Joe Shuster - is arranging a memorial brick from one of the creators' houses with a plaque for Meyer. They have also offered to fly the Granite City man and a friend out for a tour of their city’s Superman museums and tourist sites. That’s not even including the actual comic book donations themselves or the other legion of good samaritan super-fans joining the relief effort on facebook daily! That is what makes this story one of the best of the year. Sure “Gary” is getting off lightly when Mike describes him as a "no-good excuse for a human being", but the way fandom aren’t letting it tarnish his love of the character is just mind-blowing. The fact the gifts assembled will be delivered to the 48 year old fan by Howard dressed as the Reeves-era Superman, along with his daughter in her Supergirl outfit, and other fans is just icing on the cake. Asked ‘Why Superman?’ Meyer responded; "He uses his powers not to benefit himself, but to help others. He's the champion of the oppressed." Mate, I couldn’t agree with you more. Wow! I feel so bad for the poor guy who was so trusting to these two despicable pieces of excrement! I am so glad so many people came to this guy's aid, and are working so hard to give back his piece of happiness in this world. I also echo the Charlie Atkins' comment, in how I'd be really pissed as well if that was done to me. Thank god for everyday people coming to this guy's rescue, and proving that you truly don't need a costume or super-powers to help people out. No worries Dale - I was looking to post it before it had a positive turn of events, but I'm glad I held off - fandom coming to Mike's aid really shows what an awesome sub-culture of society comic fans are! While if it happened to me I'd be consumed with enough rage to become an instant red lantern, it's always good to get a feel good story in the mix. Hopefully the story has an even happier ending! I'm currently thinning my own collection ready for the move to Australia too, and if I thought any of my Superman comics that I'm not taking with me could fill any gaps I would've fired them away, but the deadline for donations was this week so they wouldn't have made it in time. As much as i love DC, but right now, I cannot bare what they have done to my favorite characters with that disgusting, trashy new 52. I am glad it's failing. i guess thats what they get for deciding to alienate the dc universe. At this point and time, i miss the real DC universe now, more than ever! The comic book shop was in Cleveland. They flew him to Cleveland so he could see the house where Siegel and Shuster wrote the earliest Superman comics. Well at least you had city in the same state.